My favourite product from a French pharmacy brand is La Roche Posay Effaclar K. It leaves my troublesome t-zone looking a lot more refined, which is no easy task. I love la Roche-posey at the moment the effaclar ai is amazing! Got to be Embryolisse…with a side helping of Nuxe Reve de miel lipbalm. Ooh, and Bioderma sebum control moisturiser is an AWESOME primer. OK, I’m done. My favourite would be the Nuxe eye cream – Nuxe Contour des Yeux Prodigieux, really depuffs my eyes and hydrates them! Leaves me looking fresh with bright eyes in the morning. I love that avene thermal water spritz, it’s so refreshing without being drying at all! Have loved Klorane products since first discovering their camomile make up remover as an au pair many many moons ago! My absolute favourite is one that’s actually on your list, namely LRP Lipikar Baume AP. I have two children with atopic skin, in addition to battling with dry skin this time of the year myself, and Lipikar Baume has been a lifesaver, which we buy by the bucketload in this household. Something seems to be in the air – I’ve been twittering away about the joys of Parisian pharmacies and Monoprix’s skincare and toiletries all week. Nuxe and La Roche P are my favourites. These are the best for warding away the Dandy’s dry areas that appear when lashed by icy winds and baked alive by ramped up central heating. Too bad I stocked up at the weekend – but too good for everyone else!! Oh, i love french farmacy, although i’ve got to know it just recently. I love the Avene water and Avene Cleanance series, i love Toleriane and Effaclar lines from LRP. But my recent “win-win-win” product is Exfoliac Acnomega200. My skin’s been getting worse and worse in terms of acne and this one is my savior (i hope they never discontinue it). I am a huge fan of La Roche Posay’s Effaklar K – it’s a cross between a moisturiser and an exfoliator and does wonders to my spotty, yucky middleaged skin overnight. Also the AI is fab overnight on angry red spots! Klorane cornflower eye make up remover is fantastic stuff and I’ve been using it since I was in my 20s. Phyto haircare is fabulous as well – their volumising shampoo actually volumises! And Bioderma Sensibio is an absolutely cracking micellar water – I prefer it to anything else I’ve used – doesn’t make my eyes sting at all. Hard to pick a favourite from all those – I’d be torn between the Effaklar K and the Bioderma. I love all la Roche posay sun care, and their effaclar duo totally cleared my skin up. I’ve yet to try any French Pharmacy brands but I’ve been wanting to try a micellar water for a while, maybe now is the time to pick one up! Lipikar Baume AP is my go-to product for my very dry itchy skin. Actually i don’t think there is a single skin care product from La Roche Posay Effaclar that I don’t like. I tried them all and for my skin (dry/combination) they are perfect. I have used quite a bit of la roche posay, was very lucky to trial their nutritic intense riche, which was so nourishing for my dry skin, just may take advantage of the third off at escentual. Also love their Cicaplast baume. Of the above the only one i have used is the LAP Effaclar AI,which i find very effective and not at all drying. Have also tried various potions from nuxe. Would absolutely love to win the prize as my skin is so irritated at the moment, especialy the Klorane make up remover and the A-Derma. Caudalie Beauty Elixer – it was lovely to use on a long haul flight recently and I also use it at my desk at work in my dehydratingi office. I’ve loved the Caudalie Vinosource S.O.S Thirst Quenching Serum, been dying to try out La Roche-Posay products thou, especially the La Roche-Posay Effaclar Duo. I have a combo- sensitive skin and no high street product has ever suited me. I discovered the french pharmacy brands 4 years ago and my skin is in heaven. i pretty much love the vichy normaderm and la roche posay effaclar range and the matte moisturising creams from both are repeat buys. Would love to try the new products from this competition! I’m a French girl living in London, and it’s not always to find french brand (not too expensive) products… thanks for the tip! My best french product at the moment is the shampoo for blonde. Avene’s Clearance K and La Roche Posay’s Effaclar Duo are two must haves for my acne prone skin. I love french pharmacy brands. My favourites have been the nuxe reve de miel lipbalm and vichy body milk. French pharmacy brands are the BEST! My favorite brand is Uriage. The Uriage cold cream is awesome for my dry skin and works! I also love A-Derma and Ducray dry skin line. I plan to go to France soon so I can stock up everything from their pharmacies! I love Bioderma & also Nuxe’s lipbalm in the pot – I can’t pick a favorite between them! My favourite product is the Klorane dry shampoo – it is a lifesaver on days when I’ve slept in and don’t have time to wash my hair, plus it doesn’t leave as much white residue as Batsiste. I was in Paris last year on a whirlwind visit and only got to buy a couple of the big bottles of Bioderma Crealine H2O, despite my long list of pharmacy picks. Of course, I scoured the internet til I found a retailer for Embryolisse Lait Creme Concentre, and promptly ordered a tube. I was suffering from strange skin at the time – dry patches, even on my undereyes, and some really oily ones. Pretty sure that the Embryolisse helped to return it to its normal, slightly-oily (but still a vast improvement form before) state. I’m on my second tube now! My favorite French pharmacy product is La Roche-Posay Cicaplast Baume B5. I discovered it while visiting a friend in Germany (I live in the US) and before my trip was over, I bought 4 tubes of it to last me through winter & spring! i have been loving la roche posays effaclar duo and ai, they have seriously helped with my blemishes! Why oh why do they not stock Embryolisse? My favourite french pharmacy brand has to be La Roche Posay, their Hydraphase moisturisers are amazing for dehydrated skin! My current favourite french pharmacy products at the moment have to be Vichy’s Idealia moisturiser and Idealia Pro Dark Spot Corrector, they’re amazing for sensitive skin as they’re both Paraben free and Hypoallergenic. I would highly suggest all of Vichy’s and La Roche Posay’s products but in particular Vichy’s new Idealia range. I’m using the foam la Roche Posay oil balancing face wash and it’s the best I have used so far. If your pharmacy picks give me your skin I will be thrilled! My faves are La Roche Posay suncare, Bioderma Crealine, Nuxe Huile Prodigiuse (or however you spell it) but would love to try more. So many things from la roche posay! Maybe effeclar duo right now, though I also like effeclar k and the effeclar cleansing gel. Definitely planning to try more. I haven’t tried anything from a French pharmacy brand but I’m always looking for new and better ways to care for my skin. Just started using effaclar K this week and long time user of Bioderm micellular water. Love them both. I tried both Phyto & La Roche Posay products when in Paris and got obsessed with the LRP skincare! The Effaclar Duo & Effaclar K are amazing! My fav French pharmacy item has got to be the cliched caudalie beauty elixir. It really helped calm my skin down durring the hot summer and any time eles I breakout with spots. My current fav is Avene Triacneal, it really works well for blemished, uneven skin. I’d love to try these products – thank you for hosting this great giveaway! For a bit of a treat the Nuxe Reve de Miel lip balm works, smells yum, and does last ages, but I wouldn’t want to be without a-Derma’s oat milk cleansing bar – absolutely the best on dry, irritable skin – it’s soap free and it’s so gentle. Hi, i tried LRP Redermic eye cream…loved it!! !…but the best product i bought is the Bioderma H20 micellar water..amazing!!! I’ve tried Avene and Klorane products, and have been eyeing La Roche-Posay for a little while! My favourite french pharmacy brand product is Avene Micellar Lotion. It makes removing make up and cleansing so easy – hardly takes any effort to remove it – and leaves my skin really soft. Since changing how I moisturise, my hormonal, oily skin has really calmed down. All thanks to La Roche-Posay Effaclar Duo and learning about it from beauty blogs! I have not tried everything I’d like to, but so far Nuxe’s Rêve de Miel–Honey Lip Balm is my favorite French product. Would like to win this little set to try to some other things! My husband actually came home from the store with a La Roche Posay after-sun cream (he’d burned himself while collecting samples via SCUBA). It’s the best after-sun care I’ve ever used, and I sneak some of it now and then for regular moisturizing. I’m curious about the rest of the range… Thanks for hosting this contest! I JUST bought a bottle of Klorane eyemakeup remover. It was the most expensive one I’ve ever purchased AND it was on sale. I haven’t used it yet as I want it to last forever. The few times I’ve ever been in a pharmacy that sells French brands I always stare longingly at them, but they are out of my budget comfort zone. I’ve tried La Roche Posay when my dermatologist recommended it for my dry flaky skin as a result of the harsh topical creams I used for my acne. I’ve always wanted to try Vichy and Avene, but it’s hard to find where I live. I love everything from Caudalie and LRP Lipikar Baume AP saves my poor shins from being savaged by me scratching them in my sleep. It’s the only thing that doesn’t make them sting when they’re super dry. I have become a big fan of Nuxe recently and have just purchased the Reve de Miel lip balm. Also so far I have enjoyed everything that I have tried from La Roche Posay. Next on my list is Caudalie! I’ve not tried as much as I’d like to, but I have loved Vichy’s dermablend corrective foundation if that counts. I had quite a few marks from serious eczema that made me think everyone was always staring at me. It covered them well until time faded them away. IS this open to people in the US? I’ve tried nuxe rev de miel, and I likt it a lot. They also sell caudalie here and I love their SOS serum! I haven’t tried anything acutally, but the Eau Thermale spray looks so useful! La Roche Posay effaclar duo and everything vichy have literally saved my skin! I will never use any other brands ever again! For the last year I have been trying different brands to try and cure my adult acne, then two months ago I came across these brands and my skin have never looked or felt better! They are amazing! I’ve tried the Eau Thermale from Avéne. I use it a lot, especially on hot summer days, as a setting spray and also after removing my makeup. Hi Charlotte. The only one I’ve tried so far is Bioderma miscellar solution, which I bought online from a French pharmacy site, after reading about it on a couple of beauty blogs. I have very dry skin, prone to acne/rosacea, and find this the most sensitive stuff for cleansing every morning and evening. It never irritates my eyes when removing make up, and one second holding it on my eyes and then swiping across removes everything, it’s brilliant. With my skin, I am always looking to try some of these brands you’ve blogged about as they seem perfect for problematic skin, so I would love to win a set and try them out. I bought the A-Derma Epitheliale A.H Repairing Cream last time Escentual did this promotion and I love how fast it sinks in. bioderma is the best makeup remover i’ve ever tried, i always pick up some when i’m abroad – i’m so excited that boots will soon be stocking it! I love micellar water, use RoC just now but will be trying out Bioderma when it wings its’ way to Blighty. I rate A-Derma face and body wash, keep it in the shower and use it in the morning. My first cleanser and moisturiser were Vichy which i got way back in 1986! Also love La Roche Posay and Avene thermal water. I tried Bioderma and Nuxe Huile Prodigeuse after a very short trip to Paris last year – I loved the Bioderma, and the Nuxe is brilliant. Would love to try this stuff as well! 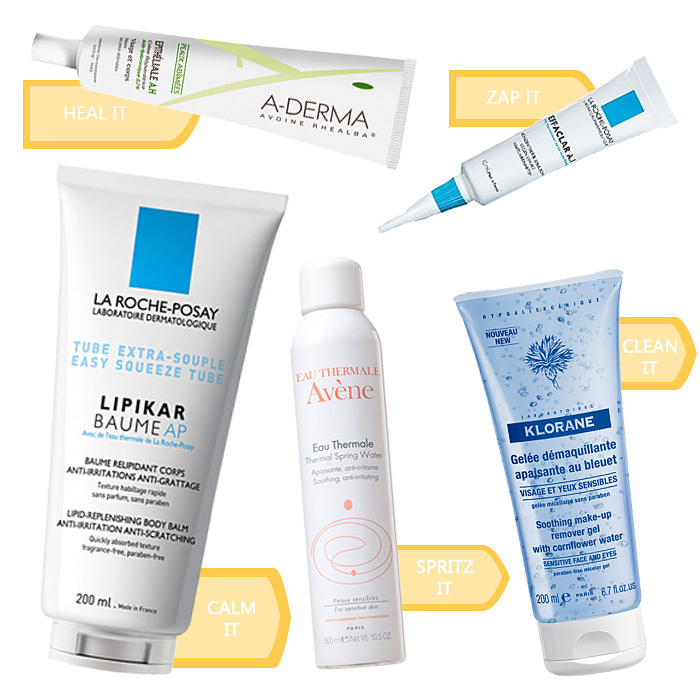 My favourite has to be the La Roche Posay Effaclar Duo, completely saved my skin! I’ve never tried anything from a French pharmacy brand before. I like La Roche Posay products, especially the Hydraphase with SPF! I love the Klorane make-up remover but I’m also really fond of everything from La Roche Posay the Kerium shampoo for an irritated scalp is great really effective. I’m a cliche – I really do love the Bioderma micellar water – takes my makeup with zero effort involved! My favourite French pharmacy product is La Roche-Posay Lipikar Surgras – Ultra Rich Body Wash. I’ve got really dry skins and this gorgeous creamy body wash is fantastic for me. It smells great too. I love French pharmacy brands. Nuxe Reve de Miel lip balm is my current favourite and I love the Effaclar and Hydraphase ranges from La Roche Posay. Loving La Roche Posay, especially the targeted breakout corrector! I’m a massive fan of Caudalie products, did not expect to like the beauty elixer as I had heard it smelt funny, however it’s actually nice (does smell a bit odd) but is pretty calming and soothing on the skin, definitely one of my must have beauty products. Apart from the famous Bioderma miscellaneous water, have bee using Vichy’s miscellaneous water for years with similar results and great for my sensitive skin. The plus is that Vichy is available in large Boots and plenty of pharmacies, no needed to go back to Spain to get it! The Avene Clenance range works wonders for me! I love the suncreams from french pharmacy brands, pretty much all the ones I’ve tried have been great! I haven’t tried anything from a French pharmacy brand yet, but am looking forward to ordering something to try from both La Roche-Posay and Avene as I’ve heard such good things! I love La Roche Posay Effaclar Duo. It keeps my skin clear and I prices its texture. I have never tried a French pharmacy brand but now I’m intrigued! Love, love, love most stuff rom French pharmacies! I wish someone had told me earlier that ultrasensitive, acne-prone skin needs gentle care instead of the massive attacks I’ve subjected it to for years. French products are perfect for that. I’ve used countless micellar lotions, thermal sprays and oils, mainly by La Roche-Posay, Avene and Caudalie. Lately, I’ve been really into the Rosaliac line by LRP and the Lipikar shower oil. The right combination works wonder. I’ve used the La-Roche Posay Anthelios daily moisturizer for years! I also love their sunscreen. And the only eye cream I’ve found that doesn’t irritate my eyes is the Avene soothing eye contour cream. I’m pretty new to French pharmacy products but I’ve been using the La Roche Posay Effaclar Duo for a few months now and love it – have purchased more form the range and they haven’t disappointed! I haven’t tried any, actually, but the five products listed here sound fantastic. Especially the first one. Unfortunately, I haven’t tried anything yet But I would like to try some Bioderma micellar water everybody is talking about! Nuxe Huile Prodigieuse! Hydrates my distinctly reptilian skin and provides a bit of shine for my flaxen (as in texture of hay) locks. My favourite is La Roche-Posay Effaclar AI, which I find both works quickly and non-drying. I do love Avene and Caudalie products as well, but they haven’t been “miracle workers” like Effaclar AI. So far, I have only tried Bioderma Sensibio H2O (Crealine) and I LOVE IT. I am adoring the La Roche-Posay Physiological Micellar Solution. Took off my long wearing lip combination the other week without fuss! Brilliant stuff.